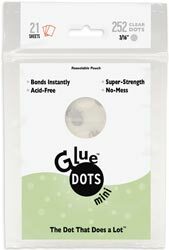 3/16" Mini Glue Dots are double-sided adhesives for permanently bonding tiny items like buttons, charms, fibers, intricate die cuts, jewels, ribbons and sequins. Glue Dots bond to most surfaces. I LOVE these for tiny buttons!